Mary Beth and I were encouraged to attend the first-ever U.S. Social Forum (USSF) by WILPF and Global Network member Carol Urner from Oregon. Carol invited Mary Beth and I to speak at two workshops she organized - one called War in Space or Life on Earth and the other called A War Economy or an Economy for Peace? When we arrived in Atlanta on June 27 we were picked up at the airport by old friends who are with the Buddhist order Nipponzan Myohoji and who built a temple in the city nine years ago. Rev. Utsumi and Sr. Denise Laffin took us downtown for the beginning of the march through the city that was to kick off the USSF. The march had at least 5,000 people in it (although the next day the newspaper reported only 1,000 were present) and was an inspiring mix of Native Americans, Black, Hispanic, disabled and a high percentage of young people. The nearly two-hour march went by the Grady Memorial Hospital where we were met by a large delegation of hospital workers chanting "Don't close Grady". Our friends told us the hospital serves the poor and uninsured in Atlanta and is facing closure because of financial problems. This was all the more real for us as we had just seen Michael Moore's new move Sicko which is all about the ailing health care system in the U.S.
More than 10,000 people attended the USSF and each day three workshop sessions were held at various venues around the downtown area. Each workshop slot had about 100 choices so it was difficult to decide from among so many interesting topics. The first workshop I went to was called They left us here to die and was a chilling testimony from four survivors of the hurricane Katrina in New Orleans. One woman told us that more than 140,000 people in the city did not have the resources to be able to leave before the storm hit. She shared how she decided to stay to help take care of family members, several of whom died in the flood that followed. Most of the workshop focused on the aftermath and they reported that today white people are moving into black people's homes. The told the story about one Bush administration representative having said that "We've been wanting to get rid of public housing for years and now God has done it for us." Rents and electric bills have tripled since the storm and people have to "work three jobs and a hustle on the side" just to survive. One presenter said because of the growing crime (largely due to unemployment) the city is "militarizing for permanent martial law." The black residents feel they are disposable people - marginalized, dehumanized, facing genocide. 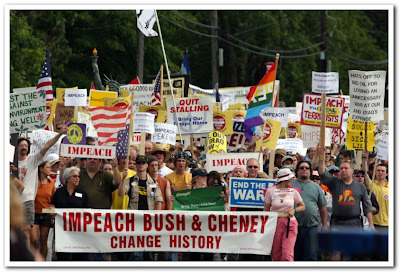 Protests should have been held all across America when Bush let the government ignore the people after the hurricane, they said. An International Tribunal on Hurricanes Katrina & Rita is now being organized for New Orleans on Aug 29-Sept 2. There was much social justice activity at the forum as Black and Hispanic community groups from Los Angeles to New York City brought community people by the busloads. The growing economic disparity in America, with the widening gap between rich and poor, is reflected in a tremendous surge of organizing on these issues across the nation. Much emphasis is being put on the growth of the prison population as there are now 2.5 million people in jail in the U.S. While Black people in the U.S. are only 12% of the total population, they represent 55% of those now in jail. No justice - no peace was one chant I heard coming out of many of the workshop rooms. At one of the workshops, where Mary Beth and I spoke, we had the privilege of meeting several students from the University of Central Florida (UCF) in Orlando. They reported on their efforts to organize on campus against the militarization of the university as NASA and the aerospace industry are increasing their control of the school. They recently held a student walk-out and 300 students joined the event. Campus organizing against the militarization of higher education is spreading across the country and in recent times we have heard of student protests at places like University of Oregon, University of Hawaii, University of California-Berkeley, Carnegie Mellon University in Pittsburgh, and the University of New Mexico. The so-called "Revolution in Military Affairs" is driving this militarization of education as "high-tech" specialization takes over many departments with funding from the weapons industry. Much of this is space weapons related research and development. Another very interesting workshop that I attended was called The Revolution will not be funded: Beyond the non-profit Industrial Complex. This jam packed workshop had more than 200 mostly young people in it. It was clear that many of them are trying to find a way to make a living doing political work rather than working in the corporate mainstream. The presenters, all young folks from groups like Incite! and Left Turn, talked about the problems with finding foundation support these days. They reported how grants allow little opportunity for political analysis, and how competition between groups over funding takes precedence over cooperation. The result is, at some level, the corporate takeover of the left via non-profit funding as some groups shave the edges of their program to be more "attractive" to funders. One organization told the story of how the Ford Foundation retracted a grant because they refused to change their position in support of the Palestinian people. Much time was spent talking about new models for setting up groups. Several young people reported they were moving away from full-time paid staff, using more volunteers, paying all staff the same amount, sharing job responsibilities evenly, and exploring other ways to collectively share power within their organizations. At a workshop called No Military Bases I found myself in very good company as Leslie Cagan (UFPJ National Coordinator), Bal Pinguel (AFSC Peacebuilding & Demilitarization Program Coordinator), Alfred Marder (U.S. Peace Council), Medea Benjamin (Code Pink), John Lindsay-Poland, (Fellowship of Reconciliation's Latin America Co-Coordinator), JoAnn Sheehan (War Resisters League), Jackie Cabasso (Western States Legal Foundation), Col. Ann Wright (retired Army and State Dept official) and Dennis Brutus (Poet and former South African political prisoner) were all in the audience. We spent a great deal of time talking about the need to get the U.S. anti-war movement to focus more on the roles and consequences of military bases outside and inside the U.S. An International Network for the Abolition of Foreign Military Bases has been established (which the Global Network has joined) and we talked about various strategies of expanded anti-bases work. One woman from Japan reported on organizing in Okinawa to close a U.S. Marine base that is now planning to expand its runway, while an organizer from Hawaii told about resistance to U.S. bases there. I suggested that one thing we could do was to build support for the Global Network's annual space organizing conference and protest planned to be held in Omaha, Nebraska next April 11-13, 2008. These events will focus on the U.S. Strategic Command (StratCom) base that is now in charge of “full-spectrum global strike” (staging offensive, preemptive attacks); combating weapons of mass destruction; space and computer warfare; ballistic missile defense; and surveillance and reconnaissance (the “warrantless wiretaps” conducted by the National Security Agency.) There was much interest in participating in this event and using it to help illuminate the growing role that U.S. bases have in promoting empire. It was a much better USSF than Mary Beth and I had ever expected. We both agreed that we came away from the forum more aware of the massive amount of organizing being done throughout the country by all kinds of people who are working on issues of importance to us all. One last key thing emerged at the forum. Nearly everyone recognized the importance of showing the connections between the various issues as a way of expanding all of our efforts and increasing our collective effectiveness. Thus those working on peace issues need to talk more about how social justice issues are suffering due to growing cutbacks in human needs funding as a result of expanding militarism. Virtually everyone was on the same page as they recognized that "reforming" this broken system we live under, that cares more about profits than people and the environment, must be taken apart and rebuilt if we are to have a future on our Mother planet. None of us can change a broken system by ourselves. No one group, or segment of the movement, can make the needed changes alone. We all need each other, now more than ever. The way we work together must change just as much as the politics in Washington must change. We must move forward together, setting our egos and organizational funding needs aside, as we look to build for needed change. The conference theme was Another world is possible - another U.S. is necessary. Let's work together to make it happen! MB and I just returned from two nights visiting some friends who have a cottage overlooking the ocean on Bailey Island here in Maine. We took a neighbor kid with us to play with the daughter of our hosts, Eric and Hoa Herter. It is a beautiful spot, up on a rocky cliff, overlooking the sea. On Wednesday night we took the two kids out to watch fireworks near the old cribstone bridge. 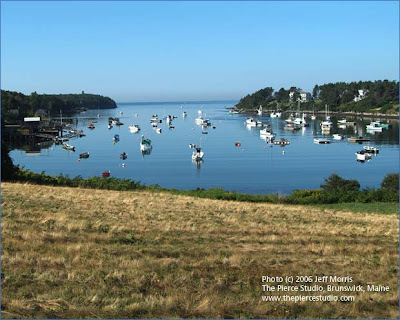 The photo above is Mackerel Cove which must be one of the most picturesque small harbors in Maine. The cove itself is largely a traditional Maine working harbor. There are a few moored pleasure boats but they are clearly the minority to a larger fleet of working class commercial lobster and fishing boats. It was easy for us to relax after our busy trip to Atlanta. Could have easily stayed a week. Just got back home from Atlanta. Was very sorry to have missed the great demonstration held in Kennebunkport yesterday during the Bush-Putin summit. There were over 3,000 people there from Maine and other northeastern states. Media all over the world covered the event since they were hanging around with not much else to do. A perfect time for a protest! Congrats to all who organized it. It was obvious that the people appreciated a chance to turn out and express themselves on the Iraq occupation, need for impeachment, and other related issues. See more photos in the link in the headline above. A bigger demo is planned again for Kennebunkport on August 25. Bush will be back for vacation then. It's going to be a summer of fun in Maine. 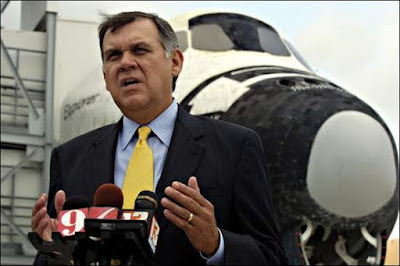 This man is Sen. Mel Martinez (R-FL). I've known him for a long time. We coached our sons baseball team together back in the early 1990's in Orlando. I got hit in a car crash once and he was my lawyer. 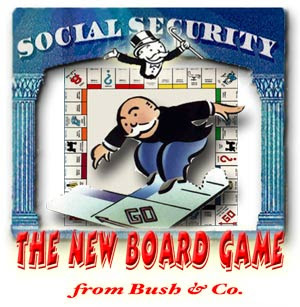 He went on to become Orange County Commissioner and then George W. Bush appointed him to his cabinet. From there Martinez went on to win the U.S. Senate seat in 2004. Many experts have reported that the Republicans did much electoral manipulations to win that year in Florida. Today Mel is the chair of the Republican National Committee. His main job is to recruit Hispanics for the Republican Party.